Yarn Orders need to be in by October 1st! Our next order comes courtesy of Handmade Saori Studio and is for Supreme (8/2 Plied Cotton and 3/2 and 5/2 Mercerized Cotton) and Mo Purl (unmercerized, mercerized and flake cottons bamboo, rayon, rayon boucle, and rayon chenille). If you are interested in participating, please contact the guild at HSVfiber@gmail.com. 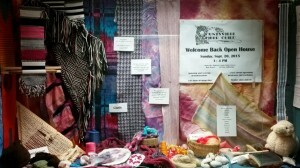 The Huntsville Fiber Guild membership year is October 1 – September 30. Renew your membership now! Your membership allows us to continue to provide workshops, bring in instructors and support the local fiber groups with materials and community forums. The Huntsville Fiber Guild is entirely volunteer led so every dollar you send us goes back out to the community. Please join so that we can continue to provide these services as well as bring in new an exciting ideas to the fiber community. The individual membership fee is $20 per year, and the family membership fee is $30 per year. Individual and family members are entitled to a classified advertisement up to 40 words long in each monthly newsletter to sell or buy fiber equipment and supplies for their personal use. 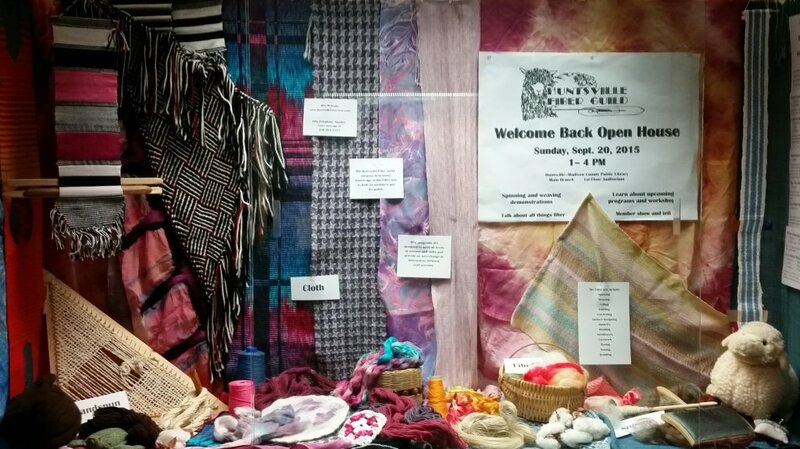 Your membership fee qualifies you for discounts on certain workshops, access to members-only discussion groups, participation in discount yarn and equipment buys. The commercial membership fee is $50 per year. Commercial members are entitled to one quarter page advertisement 3.5″ wide x 4.5″ long or 7.5″ wide x 2.25″ long in each monthly newsletter. Send the attached Membership Form and Fiber Arts Interest Survey, along with membership fee checks payable to Huntsville Fiber Guild to P.O. Box 1562 Huntsville, AL 35807. If you are visiting the Huntsville-Madison Library Main Branch take a minute to check out our display. It will be on display through the month of September.